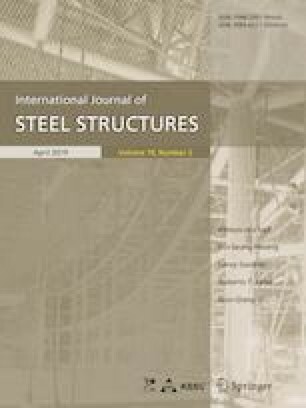 To evaluate the effectiveness of the asymmetrical steel beam section and reduced beam section (RBS), this paper presents a parametric study on weak-axis beam-to-column composite connections with asymmetrical reduced beam section subjected to horizontal cyclic loading. After validating the accuracy of the finite element modeling through comparing to the experimental results, a total of 29 refined tridimensional models for four series were created for parametric analysis. The load–displacement and moment–rotation relationships, the Mises index, triaxiality index and rupture index distribution across the width of the flange welds for each connection were reported. A smaller steel beam top and bottom flange width ratio α could alleviate the adverse effect of the composite action. The parametric analysis about the geometrical variables of RBS confirms the need for readjustment of the geometrical characteristics of the RBS in order to apply to the proposed weak-axis profiles. For design purposes, the parameter a, the distance from the skin plate to the reduced region, can be set to (0.65–0.9) bbf; the parameter b, the length of the reduced region, can be set to b = (0.65–0.90) db; the parameter c, the maximum reduction depth of beam bottom flange, can be set to 0.20 bbf, where bbf and db are the beam bottom flange width and beam depth respectively. The authors are grateful for the financial support provided by Nature Science Foundation of China (NSFC) (51278061) and the Fundamental Research Funds for the Central Universities-Cultivation (300102288201).